Have you been on pinterest? It's this amazing site that is really like an online scrapbook of ideas. It makes you feel completely inadequate and empowered all at the same time. There are so many categories like cool crafts, awesome looking recipes, fashion ideas, and even fitness plans. Anyway this is actually not a commercial for pinterest but it is where I found this recipe. 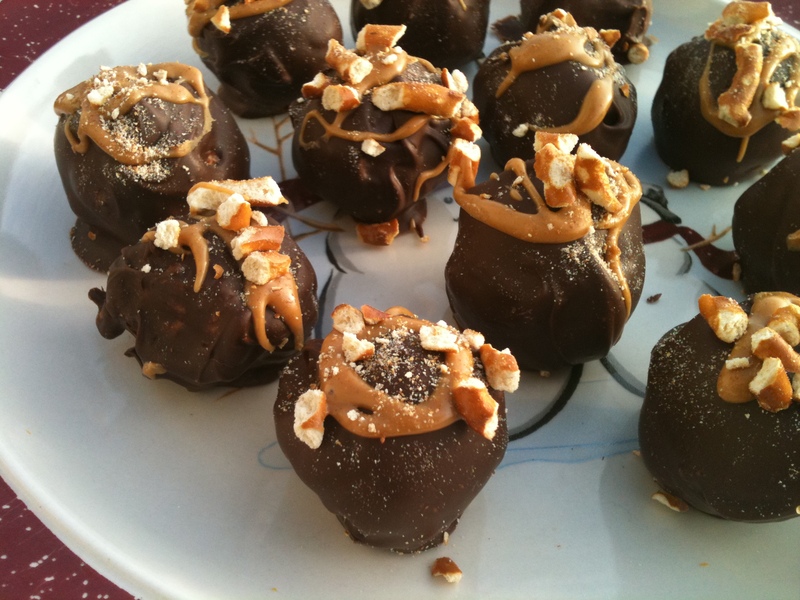 They were called Chubby Hubby Truffles (after some rather well known ice cream) or Peanut Butter Pretzel Truffles. These are quick, very easy, and they look really nice. They are a wonderful combination of salt and sweet and the creamy peanut butter is a nice texture with the crunch of the pretzels. In full disclosure - I was not thrilled with how big I accidentally made them. These are really good! Put the pretzel pieces into a resealable plastic bag and crush into very small bits - I used my food processor. In a small bowl, combine the peanut butter, butter, brown sugar and salt. Stir until all of the ingredients are completely blended and smooth. Add the pretzel bits to the peanut butter mixture and mix thoroughly. Add the powdered sugar and mix until completely combined. Line a small baking sheet or plate with wax paper. Using a small cookie scoop, or about 2 teaspoons worth of peanut butter mixture, gently roll into a ball (I put a little butter on my hand to reduce sticking and had to wash my hands after every 5 or so). Place the ball on the wax paper-lined cookie sheet and repeat with the remaining peanut butter mixture. Place the baking sheet into the refrigerator and chill for at least 30 minutes. Dip each peanut butter-pretzel ball into the melted chocolate and use a fork or spoon to roll it around, ensuring that it is completely coated with chocolate. Let any extra chocolate drip off and place back on the wax paper-lined sheet. Repeat with all of the peanut butter-pretzel balls. Return the baking sheet to the refrigerator and again chill for at least 30 minutes. Garnish with a drizzle of melted peanut butter (melt the peanut butter for 30 seconds in the microwave and use a fork to drizzle) and crushed pretzels, if desired. Store in an airtight container in the refrigerator.